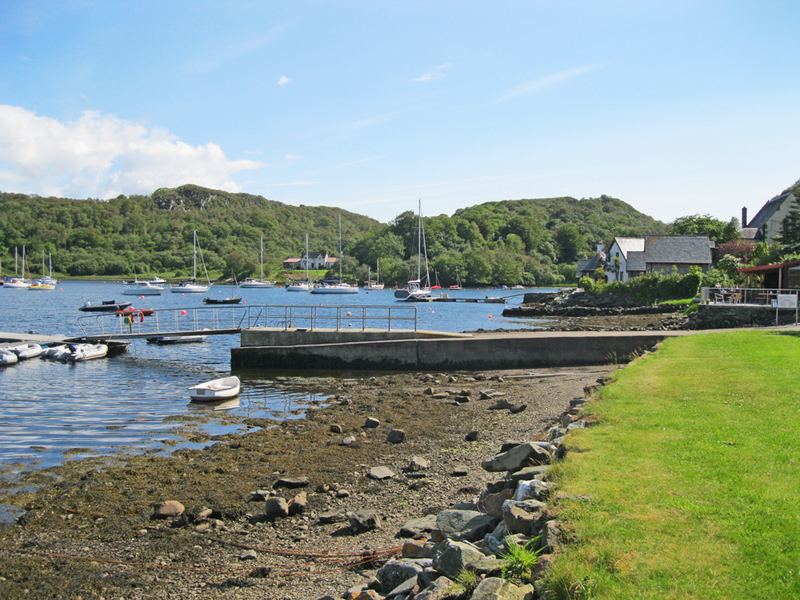 Tayvallich Bay is a well-sheltered haven which offers a safe anchorage and an all-tide pier to load/unload with a minimum depth of five feet at Low Water Springs. The access and fairway to the inner harbour have a minimum depth of five feet, and eight feet clear at high water. It should be noted that the tidal effect is much influenced by the prevailing wind direction and there is insufficient rise and fall to allow reliable drying out. Furthermore, in the winter months, ice in the inner bay can be a hazard. The Tayvallich Bay Association looks after navigation marks in the bay and the head of Loch Sween, and also the moorings in the bay on behalf of the Crown Estate Office. It has recently rebuilt the jetty alongside the shop, and the Millennium saw the installation of a superb pontoon off the jetty, making loading and unloading larger boats a much easier proposition. There is also water available at the pontoon. There is a slip alongside the jetty suitable for launching smaller boats. Tayvallich has never been a major fishing port but there has always been small-scale fishing from both Tayvallich and Carsaig. During the last twenty-five years there has been an increase in fishing activity, primarily by visiting vessels from the Kintyre ports of Tarbert, Campbeltown and Carradale. Today the industry supports some three local boats and half a dozen men full time, and is a significant aspect of both the local economy and the life of the village. Many residents and visitors have enjoyed the local angling aspect of fishing during the summer months, although no one operates fishing trips on a commercial basis. The final photo in 'More Photos' above shows the olf quay used by local fishermen. In the summer months, the Jura Passenger Ferry operates from Tayvallich to Craighouse on the island of Jura.